So where is the Facebook 4G smartphone article that Engadget posted this morning??? Engadget posted an article this morning about a possible Facebook 4G phone in the works. This rumor came from a tipster that sent Engadget a screenshot of a survey that the tipster offered on Facebook this morning. Ok, so what’s strange about this??? What’s strange is that the article no longer exists on Engadget. I’ve contacted Engadget to find out what happened with the story and I have yet to hear from them. So perhaps Engadget realized that the tip was simply not true and decided to remove the article from their site. There have already been plenty of rumors and talk about a Facebook phone before, so this isn’t really anything new. 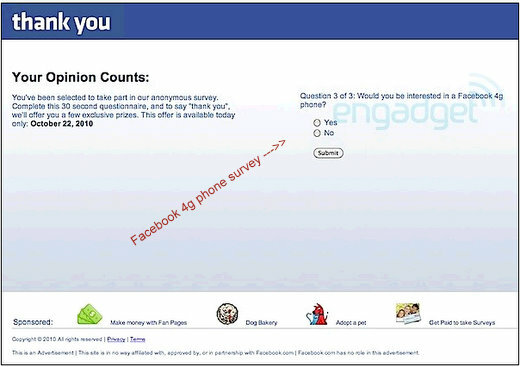 But what about the survey screenshot that Engadget posted this morning?